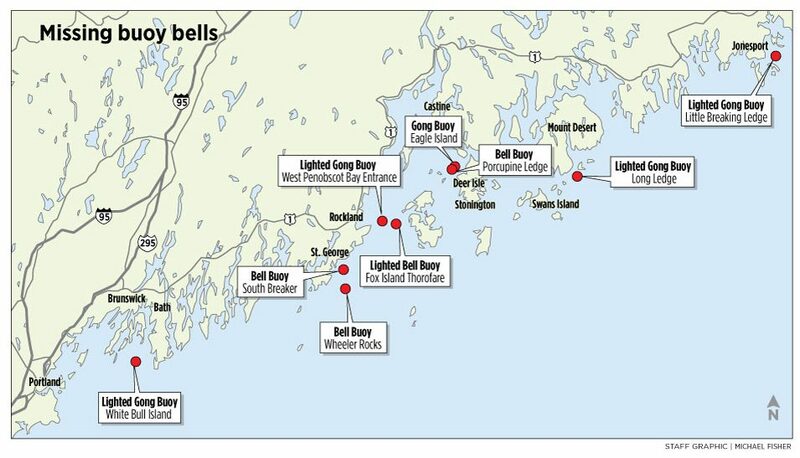 Four bells and five gongs that help guide mariners in dangerous waters off Maine's coast have been stolen since last winter. At the Coast Guard station in South Portland, Lt. Pete Fransson stands Wednesday near navigational buoys similar to those that had bells stolen from them. The Coast Guard wants the public’s help in finding the culprit behind the 2,755 pounds of stolen merchandise. The great bell caper began late last year, when the icy waters off the Maine coast would give all but the most determined thief reason to stay on dry land. The space in which a brass bell typically hangs on this buoy off the Maine coast is empty because the bell was stolen. Stealing a sound signaling device off a buoy is a federal offense, punishable with heavy fines or even imprisonment. 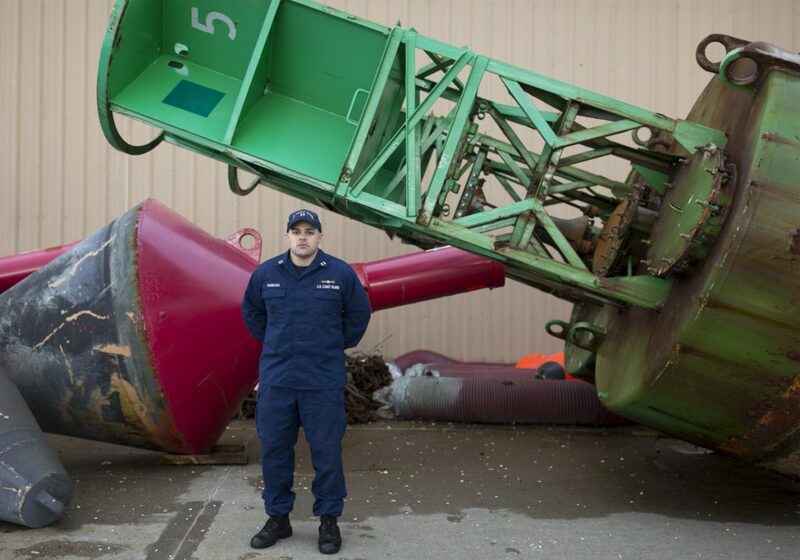 Through winter, spring and summer, the buoy bandits have picked off their targets: the heavy metal bells and gongs that sound through fog and sleet and wind to help mariners avoid dangerous waters or guide them to safety. This month, they struck again. Since December, nine of the bells or gongs that dangle from some of the dozens of U.S. Coast Guard buoys along Maine’s craggy coast have been swiped by a daring thief or thieves. 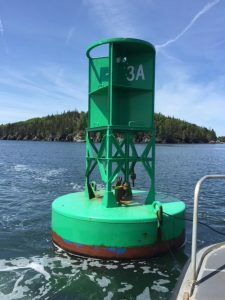 Although Maine has scores of navigational aids and only nine buoys have been targeted so far, Coast Guard officials say the situation puts mariners who depend on the buoys for emergency navigation at risk. They’re offering a potentially hefty reward for information that leads to an arrest and conviction. “These thefts not only reduce the reliability of our aids-to-navigation system and put lives at risk, but they also create a burden and expense to the taxpayer for the buoy tenders and crews responsible for maintaining the aids,” Lt. Matthew Odom, chief of the Waterways Management Division for Coast Guard Sector Northern New England, said in a statement. By federal law, anyone who steals a navigational aid could be liable for up to $25,000 per day in penalties per buoy, or up to one year in prison. The statute also lays out parameters for the reward, which can total up to half of the fines levied against the perpetrator. So far the thefts have perplexed the Coast Guard and locals alike, who think the items are being resold at nautical stores or at scrap yards. Matt Ripley, the harbormaster in Rockland, can’t imagine why someone would steal such an important navigational aid. The thefts have exacted a heavy price. 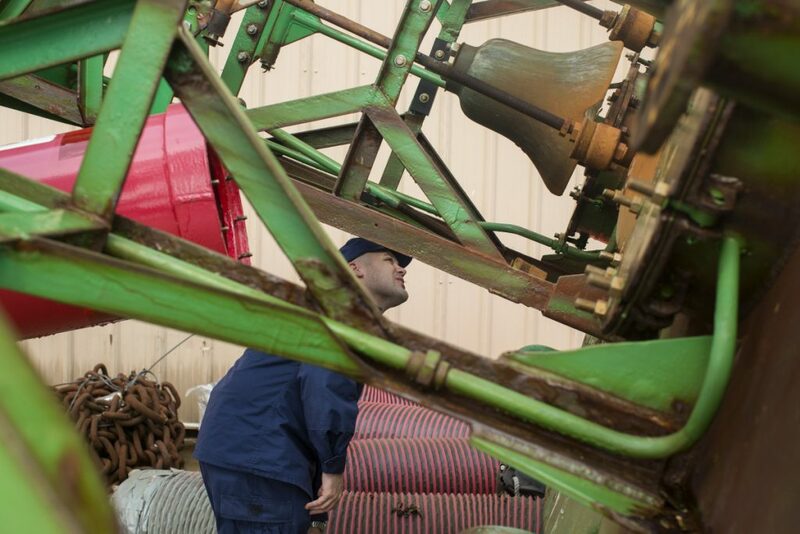 So far, the Coast Guard has spent roughly $29,000 for new gongs and bells, and an unknown additional amount of time and labor to fix and replace the equipment, Coast Guard spokesman Lt. Pete Fransson said. It wasn’t clear Wednesday how the devices are being removed from the buoys, but whoever is doing so is likely using heavy equipment. Four bells have been stolen, each weighing in at a portly 225 pounds. The five gongs, which resemble three thick beveled dinner plates stacked upside down on top of each other, weigh even more: 371 pounds apiece. Together, the stolen merchandise weighs a combined 2,755 pounds, beyond what someone could easily cart away in their weekend skiff. So how much can a buoy bell really be worth? Depending on the global market for copper, the answer could be a lot. Coast Guard regulations require that the devices be made of a copper-silicone alloy. Some formulations are known for their high resistance to corrosion, making them suitable candidates for the onslaught of salt spray that buoys must stand up to. Justin Lerman, whose family has owned E. Perry Iron and Metal for four generations, said that right now silicon bronze – which is in the same family of copper alloys used for the bells and gongs – brings roughly $1.50 per pound, making the nearly 1.5 ton haul of Coast Guard property worth more than $4,000. Anyone with information regarding the missing signaling devices is urged to contact the Coast Guard Sector Northern New England command center at 767-0303.